The state high school wrestling season up here in Wisconsin is moving toward its climax. At the end of this month the Wisconsin Interscholastic Athletic Association will host the 72nd annual individual wrestling tournament at the Kohl Center in Madison. For the first two days, six mats will cover the floor with constant action in all three divisions of competition. For Saturday’s finals, they’ll go down to three mats. At the end of the day, each division will crown state champions in 14 weight classes. There will be a whole lot of wrestling going on over those three days, but that won’t be the end of the season. The following weekend, team champions will be determined in a three-day event at the UW Field House. I wasn’t a wrestler in high school—too tall, too skinny, and our school didn’t have a team anyway. My father coached wrestling for a couple seasons at St. Francis High School, a small suburb of Milwaukee, back in the early sixties as he was beginning his career in education. I’ve always had a great deal of respect for wrestlers, because to get proficient at that sport you have to train and train hard, and when you compete it’s just you and the opponent out there on the mat. If you make a mistake, there’s no teammate waiting to make the tackle you miss or advance the runner after you strike out. It’s all up to you. If anybody in athletics can be called a real warrior, it is the wrestler. Wrestling as a sport goes back a long ways. Cave paintings in Mongolia show two naked men grappling in front of a crowd some 7,000 years ago. The original Olympic Games in ancient Greece featured wrestling as early as the 8th century BC. 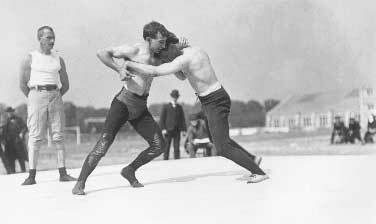 Greco-Roman wrestling was included in the first modern Olympics in 1896. The 1900 Games did not feature the sport, but both Greco-Roman and freestyle were on the bill at the 1904 Games in St. Louis, and they’ve been there ever since, with women’s freestyle added in 2004. Freestyle competition at the 1904 Olympics. Americans swept the medals in all 7 weight classes, although two of them were Norwegian citizens at the time. 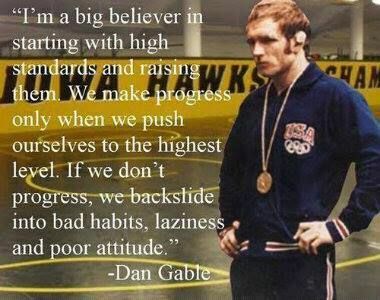 A few years back I read a book about the life of the man who is, without question, one of the greatest wrestlers of modern times: Dan Gable. Growing up in southwest Wisconsin, only a few miles from Iowa, we got a lot of our news from across the river, and much of it was about Iowa wrestling. As basketball is to Indiana and football to Texas, wrestling is to Iowa; more than a sport, it is nearly a religion, in terms of the devotion it inspires. In the early and mid-seventies, Iowa wrestling was all about Dan Gable, and forty years later much of it still is. Gable’s story is legend in Iowa and among wrestling fans everywhere. In fact, if it had been a Hollywood movie, nobody would’ve believed it. Gable grew up in Waterloo and like many Iowa lads in the early sixties he took to wrestling, although he was also an outstanding swimmer. Gable’s family life wasn’t the easiest: his father was a real-estate salesman and often gone, and both parents were hard drinkers. In 1964, when young Dan was 15, his 19-year-old sister Diane was assaulted and murdered in their home by a teenage neighbor boy. Her tragic death inspired her brother to train even harder on the mat. Gable went undefeated during his high school varsity career at Waterloo West, going 64-0 with three consecutive state championships. As a collegian at Iowa State, Gable was ineligible for varsity competition as a freshman under the rules of the day, but his perfect career continued when he donned the Cyclones’ red and gold colors for real. He won his first 117 varsity matches and two straight NCAA titles. In the 1970 national finals in Evanston, Illinois, Gable was heavily favored to complete his trifecta of perfection. But in the title bout he struggled against Washington sophomore Larry Owings and lost a 13-11 decision. The stunned crowd, having witnessed one of the greatest upsets in college sports history, gave Gable a five-minute standing ovation when he stepped onto the awards stand. Despite Gable’s loss, Iowa State captured the national championship for the second year in a row, but nobody was talking about that. March 1970. 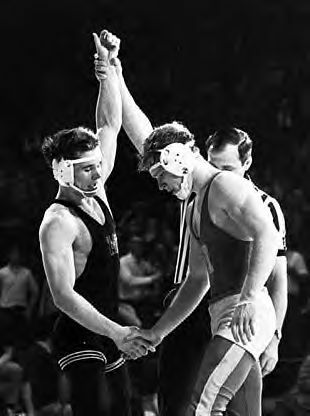 For the first time in 118 college varsity matches, Gable’s arm is not the one raised in victory. His college career had come to a shocking end, but Gable didn’t leave the mat. In 1971 he won gold at the Pan-Am Games and took first in the World Championships in Bulgaria. Gable was pointing toward the 1972 Munich Olympics. In 1968, coming off his first national title as a college sophomore, he had lost in the Olympic trials, getting pinned by an Air Force Academy wrestler–the only time Gable was ever defeated by pin–and then he was eliminated in an 11-1 loss to future Iowa State coach Bobby Douglas. Gable had started off that tournament with an easy 13-4 win over Owings, who had just graduated from high school after a sensational prep career in Washington. Owings later said that loss motivated him to come back after Gable two years later at the NCAAs, even though he had to drop two weight classes to get to Gable at 142 pounds. But in ’72, Gable was on a mission. His goal was not just to win Olympic gold but to dominate the field, and nobody was going to stop him, not Owings, not anybody in the U.S. and certainly not any foreigner. At the Olympic district qualifying meet he pinned all six of his opponents, earning a trip to the trials in Anoka, Minnesota. Gable continued to toy with the competition, winning two matches by pin and two others by whopping scores of 21-0 and 27-0. Then came the rubber match with the man who had beaten him in the ’70 NCAAs. Owings had not been able to repeat his sophomore year glory, finishing as national runner-up each of the next two seasons. The pressure of being the guy who finally beat Gable was starting to get to him, affecting his marriage and his personal life. Entering the trials, he questioned whether he even wanted to go to Munich. Gable, on the other hand, had no doubts whatsoever and was completely focused, unlike two years earlier, when he had been distracted by pestering media questions right up to the start of the title match. At Anoka, he took Owings easily, 7-1, and won four more matches to clinch the Olympic berth. In Munich he destroyed the field, winning all six matches decisively. In fact, after beating Owings, the path to Olympic gold saw Gable go 10-0 with four pins and six wins by decision with a combined score of 75-0. Gable dominates another helpless Olympic opponent at Munich in ’72. Gable gave up competitive wrestling in 1975 as injuries started to take their toll. In 1976 he became head coach at the University of Iowa, and his legend grew even larger. Over the next 21 seasons, Gable’s Hawkeyes set a standard of athletic dominance not seen before or since. 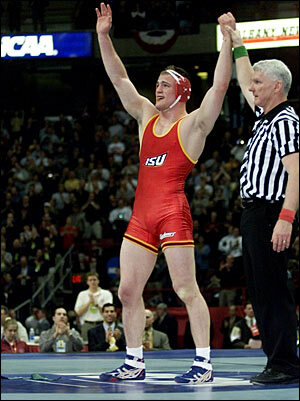 His penultimate season, 1996-97, is chronicled in the book A Season on the Mat by Nolan Zavoral. Even though he underwent hip replacement surgery in mid-season, Gable was able to return quickly and lead the Hawkeyes to the Big 10 and NCAA titles. The conference crown was Gable’s 21st in a row; the national title, won with a record 170 points before roaring capacity crowds in Cedar Falls, Iowa, was his 15th. March 2002. For the 159th and last time as a collegian, Sanderson’s arm is raised in triumph. Sanderson capped his career with a gold medal at the 2004 Athens Olympics, and in 2006 he succeeded Douglas as head coach at Iowa State. He led the Cyclones to a pair of Big XII conference titles and was runner-up at the ’07 NCAAs. Moving on to Penn State in 2009, he coached the Nittany Lions to a national championship in 2011, the first of four in a row. This year his team is ranked fifth in the nation as the national tournament approaches. 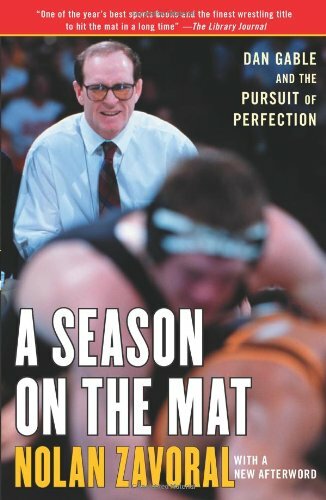 Gable retired as Iowa head coach after the ’97 championship, but his influence on the Iowa program, and all of college wrestling, continues to this day. His successors at Iowa, Jim Zalesky and then Tom Brands, have continued the tradition, each winning three national titles, the most recent under Brands in 2010 before Sanderson began his run at Penn State. Former Gable assistant J Robinson has built a strong program at Minnesota, winning three national titles between 2001 and ’07; Robinson’s 2014 Gophers were runner-up to Sanderson’s Nittany Lions, giving Sanderson a bit of revenge on Robinson from ’07 when his Iowa State team was edged out by Minnesota for the title. Today Gable works as Iowa’s assistant athletic director, conducts numerous wrestling camps and travels the country speaking out in favor of high school and college wrestling programs, which are often feeling the budget knives these days; less than one-fourth of all NCAA schools currently have wrestling programs. Many schools have dropped wrestling in favor of adding more women’s programs as schools yield to political pressure in the name of gender equity. Gable, who has four daughters, argues that while women’s programs are certainly worthy, wrestling shouldn’t be sacrificed. Gable also was deeply involved in the effort to save Olympic wrestling. Early in 2013 the International Olympic Committee voted to drop the sport from the Olympics after the 2016 Games in Rio de Janeiro. The IOC reversed its decision several months later after an intense international lobbying campaign and an emotional presentation to the committee. 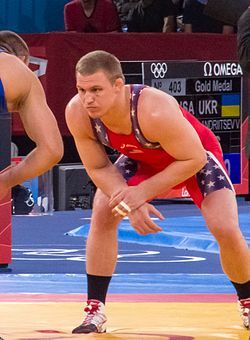 There will be some changes made in the Olympic rules for the sport, designed to jazz up the scoring and make it more palatable to the great god of the Olympics, television; among the changes, wrestlers will no longer compete on a red-colored mat, which TV had declared to be the wrong color. No doubt a purist like Gable wasn’t pleased with the changes, but if that’s what it would take to keep wrestling in the Olympics, so be it. A total of 71 nations sent wrestlers to the 2012 Games in London, with Russia leading the field by capturing 11 total medals on the combined men’s/women’s medal board. The U.S. had two men’s freestyle gold medalists, Jordan Burroughs of the University of Nebraska at 74kg and Jake Varner, one of Sanderson’s wrestlers from his Iowa State days, at 96kg. Thanks in large part to Gable, American kids can still hope to follow Jake Varner’s path to Olympic wrestling gold. Gable and Owings remain inextricably linked, 45 years after their epic match in Evanston. Last year, SI.com did a great “Where Are They Now?” report on the two men: Where are they now? What fascinated me about the stories of Gable and Owings, Sanderson and Chagolla, is not the records of their triumphs, which are incredible enough. But what drove them to achieve such unparalleled success at one of the most difficult sports around? It was said that Gable trained so hard that some days he could only manage to crawl off the mat. Usually he would train for two or three hours a day, every day. In the off-season he might cut down to one hour a day. Sanderson, who certainly dealt with immense pressure as his college streak went on and on, said he set as his goal to get better every day, even a little bit, and he kept thinking positively. In all my studies of warriors, it always comes down to one thing: dedication. Hand-in-hand with that is another word: discipline. Whatever endeavor you may choose to pursue, success cannot be achieved without dedication, and to remain dedicated you must be disciplined. We often think of this kind of discipline in relation to athletics. We think of Ted Williams taking swing after swing in the batting cage, of Larry Bird shooting hundreds of jump shots in an empty gym, of Peyton Manning studying endless game film to find cracks in an opposing defense. But this discipline is also reflected by the college student who stays home studying at night instead of partying, the worker who shows up on time every day, the parents who care for their children at the expense of their own personal comfort. Eventually, there are rewards. For the athlete, it can be a championship. For the student, a diploma; for the worker, a comfortable retirement; for the parents, the satisfaction of seeing their children grow into productive, honorable adulthood. There are those who aren’t dedicated, of course. Always have been, always will be. In some ways I think they are more numerous than before, and that may be a subject for a later posting in this blog. But as for myself, I chose some time ago to follow the difficult path, and as I look around me I see the rewards of leading a dedicated, strenuous life: a meticulous house and gardens, a retirement account that looks better all the time, children who are grown and doing well as they strive for their own goals. I owe much of this to my parents and grandparents, who instilled these values in me, and to my wife, who is one of the most disciplined and well-organized people I’ve ever known. Regardless of outside influence, though, it always comes down to one person: yourself. So it is that tomorrow morning I will get up and head out into a dark, freezing Wisconsin winter morning to the gym in Rice Lake, then to my office for the day and finally to our martial arts dojo, where my wife and I will go through the paces on our mat, following Sanderson’s advice to get better every day. Yes, it would be easier to sleep in and skip the workout, come home right after work and watch TV after dinner. Once in awhile that’s okay, but doing it consistently rarely gets you anywhere. Whenever I need a jolt of motivation I just read about guys like these wrestlers. I’ll bet they don’t sleep in very often, either. Previous Post: Who was that masked man? Next Post: In praise of Mr. Selleck. Thanks, I’m glad it was useful. I had a fun time doing the research for the post, and the book on Gable was excellent. I do agree with all of the concepts you have presented on your post. They’re really convincing and can certainly work. Nonetheless, the posts are too quick for starters. Could you please prolong them a little from next time? Thanks for the post. Howdy! Quick question that’s totally off topic. Do you know how to make your site mobile friendly? My web site looks weird when viewing from my apple iphone. I’m trying to find a template or plugin that might be able to fix this problem. If you have any recommendations, please share. Cheers! The WordPress format I’m using for the blog seems to translate well to mobile, at least when I view it on my phone. Thanks for reading. Hello! I know this is kinda off topic however I’d figured I’d ask. Would you be interested in trading links or maybe guest writing a blog article or vice-versa? My blog goes over a lot of the same subjects as yours and I think we could greatly benefit from each other. If you might be interested feel free to shoot me an email. I look forward to hearing from you! Terrific blog by the way! Thanks for the compliment. Email’s on its way. I simply stumbled upon your blog and wanted to say that I have truly enjoyed surfing around your weblog posts. dailly and obtain good information from here everyday. You could certainly see your skills in the articles you write. aren’t afraid to say what they believe. Never stop following your heart. Thanks, glad you enjoyed it. Thanks, Amelia. I try to focus my writing on heroic themes. To me, wrestlers epitomize the toughness and integrity I like to see. You won’t find people more dedicated than wrestlers. you customize it yourself? Anyway keep up the excellent quality writing, it’s rare to see a great blog like this one today. Thanks, Roxie. No, this is not a paid theme. I used one of WordPress’s freebies and customized it myself. I’ll do my best to keep the content coming.